Welcome to the Steiner Waldorf Schools Fellowship® website. The SWSF is the membership organisation for all the Steiner schools and independent Steiner Early Years settings in the UK and Ireland. To safeguard and develop the ethos and identity of Steiner Waldorf education. To support our schools and settings in providing a high quality and distinctive education. To represent the interests of Steiner education in the wider educational, academic, social and political context. Steiner schools form the largest group of independent non-denominational private schools in the world. The first school opened in Germany in 1919, the first in the UK in 1925. 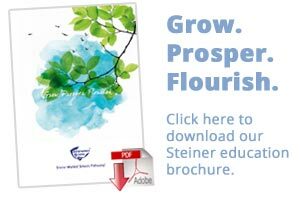 There are currently over 1,200 Steiner schools worldwide and 2,000 Early Years settings in a total of 60 different countries, 35 in the UK & Ireland. Steiner education is state funded in most European countries as well as in Australia and New Zealand. In the UK there are currently four state-funded Steiner Academies. The rest are privately funded but aspire to make their education available to as wide a community as possible. Steiner education is based on an understanding of child development that has its roots in a philosophy known as ‘anthroposophy’ (download Anthroposophy) . The educational content of anthroposophy informs the work of the teachers; it is not a belief system and is not taught in our schools. Since the first school was established the education has steadily evolved in response to changing times. It is known as Waldorf education in many European countries and in North America but is more frequently called Steiner education in the UK. It has a proven track record (see our ‘Does it work? Alumni and Testimonials’ page for more details). for providing a sound and practical basis for working with children, enabling them to find their creativity and to become free individuals who can think for themselves, make their own judgements and find their own purpose and direction in life. The Steiner movement continues to be the fastest growing independent education system in the world. The first school was founded in 1919, just after the First World War, but a great deal has happened since then and the far reaching, child-focussed, broad and balanced curriculum and teaching have evolved along with modern needs.